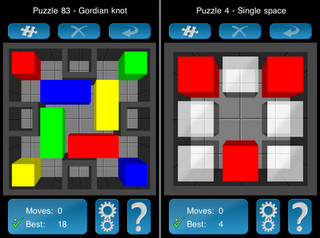 Magnetic Block Puzzle is now available on the App Store for a small amount. It's a departure from my two previous games, Reversi and Merelles, which were both abstract strategy games. 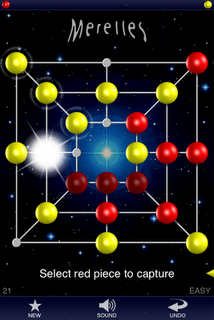 Magnetic Block Puzzle is, as the name implies, a puzzle game. The aim of each of the 110 puzzles is to join the coloured blocks, which are special magnets that only stick to other blocks of the same colour, by tilting the puzzle to make the blocks move. One of the best things about the iPhone is you can have thin fingers or fat fingers, and pressing buttons and using controls on the touch screen is still quite easy. On old-school touch screen devices (WinMob phones in particular spring to mind), one had to be very precise as the first location touched on the screen immediately triggered a touch event, which is why a stylus was almost always necessary. The iPhone takes a slightly different approach, where a touch that consists of many points on the screen (as would occur with a finger) is converted into a co-ordinate through some sort of averaging of all the points. In general this works really well. However, using this approach still requires the controls on the screen be sufficiently large that a user will be able to put a finger over it, with the average falling comfortably on the control. From my experiments, I believe a control needs to have a touch area of at least 32x32 pixels. I've been working on Merelles for the last 4 months and I'm pleased to say, I've finally finished it. It's available on the Apple App Store for a small amount. Merelles is an abstract strategy game. It is also know as Mills, x Men's Morris (4, 6, 9 and 12 men variations) and by many other names. Seeing as this is my technical blog (and the Apple NDA has been lifted), I will provide some technical details. So, I have an iPhone, I have a Mac and I have some ideas. It seemed only right that I combine them and build an iPhone application. Only problem... I hadn't done C or C++ in years and Objective-C looked a bit daunting. But, what the hell, I took the plunge.